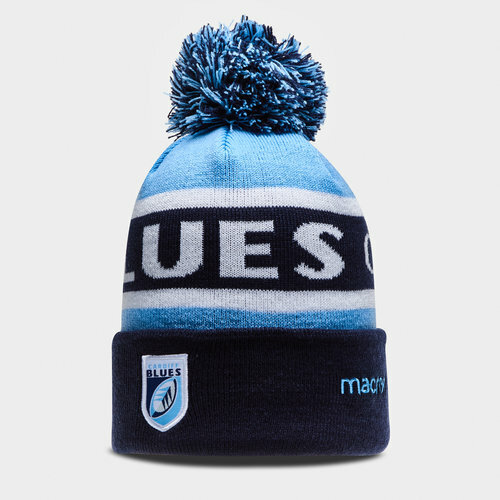 If you're a true blue then you need to showcase your loyalty in this Cardiff Blues 18/19 Bobble Rugby Beanie from Macron. The Guinness Pro 14's Cardiff Blues who were formed in 2003 want to take their game to the next level this season with the kit to match. The team have won the Anglo-Welsh Cup, the Rugby Champions Cup and the European Rugby Challange Cup. When Cardiff Arms Park is bouncing make sure the one who stands out from the crowd. This soft hat will keep you warm in cold conditions. It is the ideal item to be worn on cold winter days to support your team during match days. The hat is made from 100% acrylic and comes in a navy, sky blue and white striped colourway with a pom pom. This hat read "Blues" and has been finished with the macron logo and the Blues team crest.